A pocket version of one of the world’s most famous trick!!! This is the classic floating ball but to be performed in close up conditions. 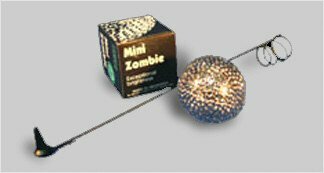 The Mini Zombie ball matches the Vernet’s Multiplying Balls. The surface is covered with thousand of facets to reflect the light. The gimmick will fit into your pocket and for the foulard you can use your own pocket handkerchief. Perfect to combine with other Vernet’s Balls Tricks.